Renault have reorganised their management team as they seek to improve on their difficult first season back in the sport as a works entry. Rob White, who has run the engine operation at Viry-Châtillon in Paris for the past few years, has moved to the Enstone chassis base in the UK, where he will be operations director. White will be responsible for ensuring the smooth running of an expanded workforce, which has grown by about 100 since Renault’s takeover of Lotus to around 560. Another 100 staff are expected to join by the end of 2017. 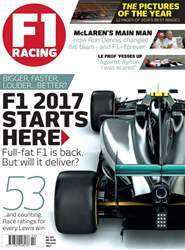 F1 2017 STARTS HERE This season’s new machinery will be better to look at and faster and more physical to drive, testing drivers’ skills as never before. But have all the implications of the changes been fully anticipated? Was the sport really so broken that it required such a massive ‘fix’? And what changes are F1’s new owners planning to make, assuming they get to buy it at all? Allison set for Mercedes, so what next for Lowe? Why 2017 is F1’s most important year – ever!